30 days before arrival, you will be charged 50% of the total amount of your stay. 15 days before, you will be charged 75% of the total amount of your stay. Later, the 100% of the total amount of your stay will be charged. 20% of the total amount of your booking is required to garantee your group booking. We will use the credit card details provided. If you have any doubts, please contact the Hostel directly. 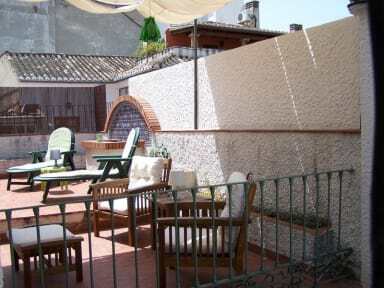 Old Town Hostel Granada is a three floor house with a roof terrace and a solarium. On third floor there is also a chill-out room with the fireplace and the free Wi-FI. Granada Old Town Hostel has a total of 6 rooms for 2, 4 or 6 people. We also offer hairdryer and laundry service for an small extra charge. In the common areas you can meet people from all over the world. The rooftop terrace and sundeck are perfect for relaxing in the hottest months of the year. And if it's cold, you'll love spending time in front of the fireplace in the attic hotspot. At any time of day, the kitchen and dining room are at your disposal for you to prepare the menu you most want. Granada Old Town Hostel is located in the city centre, near the most important monuments and close to the main commercial streets. Although the neighborhood is quite calm, the hostel is just one step away from great tapas bars and pubs. If cancelled or modified up to 2 days before the date of arrival, no fee will be charged. If cancelled or modified later or no-show, the hotel will charge 100% of the first night. Payment accepted on arrival : cash or credit cards. In case of late arrival, please email prior notice. Check in from 13:00 PM. 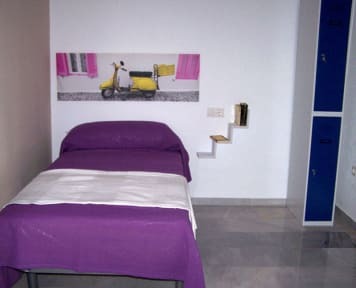 Please note that bed linen is included and towels are available at an extra cost. When booking for more than 8 persons, different policies and additional supplements may apply. Beautiful old building. We were lucky enough to have the room at the top of the spiral staircase to ourselves. Nice and quiet and clean. The person who runs the hostel is very friendly and helpful, with excellent English. This place was so lovely! There was a beautiful rooftop terrace and the building generally had really cool architecture. The lady who ran the place was so lovely and nice, and she showed us a ton of places we could visit on a map when we got there. The location is very central and close to public transit and the city center. I would definitely stay here again! A good stay. Very helpful staff and comfortable stay. We stayed on the ground floor which has a bathroom outside. The bathroom is common to the reception and hence is visible to everyone in the reception which I found a little odd. Overall, I recommend the place! The Old Town Hostel is well located and connected to the bus line. The hostel has a 24*7 open kitchen and free biscuits to munch on at any given point of the day. The ambiance is peaceful. The receptionist is extremely warm and helpful! She adviced us on how to get tickets to Alhambra. Overall a good and a pleasant stay. I recommend! Would recommend. Great little place in an old residential building. Quiet and relaxing. A little hard to find--a hanging sign would help a lot. Breakfast was decent, bathrooms were quite nice. Good location, though the little streets in the area become a bit mazelike at night. Would stay again.